Peck Slip kindergartners play next to Tweed Courthouse, where they will stay until their own building opens in 2015. Peck Slip is a new school inheriting a messy problem. The issue is the mostly dirt field in the north­­east portion of City Hall Park that serves as the playground for the school, which opened last month in temporary quarters at Tweed Court­house. Not that the school’s 46 kindergartners, who eagerly play on the sandy surface, pay it any mind. 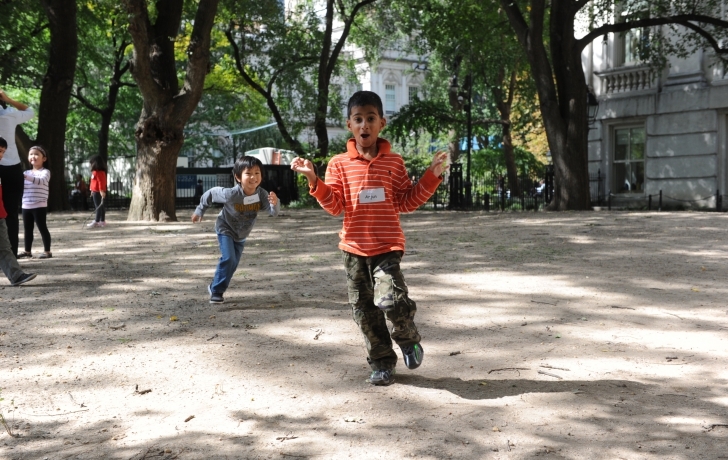 Outdoor recess among trees, squirrels, sticks and dirt is a luxury in the city. But Principal Mag­gie Siena says there’s a downside to this bit of nature and it calls for a solution: artificial turf. The area has been resodded at least three times in the six years that various new schools have occupied classrooms on the first floor of Tweed. “We’ve seeded it and sodded it over the years and we’re going to have to do that again,” Bill Castro, the Parks De­partment's Man­hattan Commissioner, told Community Board 1’s Seaport/Civic Center Committee last month. Castro said children would have to stay off the grounds for a month this year and again in late May to let the compacted soil aerate and the two applications of sod, at a cost of about $25,000, to knit. Siena, who attended the meeting, said she was glad the city wants to improve the space but was dismayed that students would lose the outdoor play. To the suggestion by community board members as well as the principal that artificial turf could be the solution, Castro said there are obstacles. At an estimated cost of $100,000 it may be too expensive, and it would not be appropriate in the historic park. He also referred to “what lies underneath that we don’t want to disturb.” That is, the sensitive issue that the area is a burial ground. UPDATE: Maggie Siena said she was informed by a park official on Oct. 1 that the cost of artificial turf would be far higher: $225,000. “I’m not saying no, but for the immediate future it’s not feasible,” he said. Nancy Harris, the principal of the Spruce Street School, which spent its first two years in Tweed, said the sod that was installed when she was there lasted about one calendar year and was “gorgeous” in the spring but not after children’s feet wore it down. “It obviously lends itself to mud when it’s wet and when it’s dry it’s a little bit like a dust bowl situation. Dust flies up and the kids cough.” She said she was told artificial turf was not feasible because of the park’s landmark status. A request for comment from the city’s Landmarks Preservation Com­mission was returned by the Parks Department. “We generally don’t install turf at historic parks but we will be installing new sod soon,” Parks spokesman Philip Abramson wrote in an email. Later, Siena said she was encouraged by a meeting with Namshik Yoon, Parks chief of operations, who she said told her that artificial turf remains a possibility. “They really want to work with us to find a long-term solution,” she said. The school will stay at Tweed until it opens in its own building in 2015. Siena said that gives her more time than previous principals had to lobby for funding for the turf. She said she will be making that request to Councilwoman Margaret Chin and Manhattan Borough President Scott Stringer.